The Ninja Coffee Bar Thermal Carafe System CF097 is a complete coffee system that allows anyone to brew up a perfect cup of coffee in their own home or office. The Thermal Carafe System is the perfect balance between fancy, complicated coffee systems and simple brewers that allow everyone to easily select their preferred brew type, cup size and style of coffee. With no pod system, the unit allows you to keep using your favorite coffee blend while brewing up truly spectacular drinks. The Ninja Coffee Bar Thermal Carafe System has five special brew types and includes a powerful frothing whisk to quickly turn either cold or hot milk to a velvety consistency, ideal for making drinks like cappuccinos, frappes and lattes. With a gorgeous stainless steel design and crystal clear water reservoir, the Ninja System looks great on your kitchen counter. The two included carafes keep your hot coffee piping hot or your iced coffee drinks refreshingly cold. 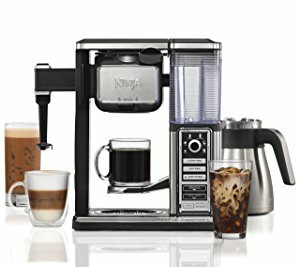 Easy to use and a snap to clean, the Ninja Coffee Bar CF097 is a comprehensive all-in-one coffee making system that is easy and fun to use. Check out its current price on Amazon. A recipe book with 20 inspirational ideas. The Ninja Smart Scoop for measuring exactly the right amount of your favorite coffee. A built-in frother able to froth both hot and cold milk to velvety perfection. A permanent, reusable filter for a clean, delicious taste. A removable water reservoir for easy filling. The special Ninja Over Ice carafe that can hold up to 10 cups (50 fluid ounces) of iced coffee. The standard Thermal Carafe that can hold up to 10 cups (50 fluid ounces) of piping hot coffee. Carafe sponge brush for easy cleaning. Elegantly designed Cafe Forte glasses. An innovative coffee caddy for storing and organizing your coffee supplies. An XL Multi-Serve tumbler that can hold up to 22 fluid ounces of either iced or hot coffee. The Ninja Coffee Bar with Thermal Carafe truly has everything that you need to enjoy the perfect cup of coffee. Many satisfied users have commented about how the brew selector allows them to make exactly the right strength of coffee with only half the grounds. The included frother has also garnered rave reviews as many people like using it to make so-called “bulletproof” coffee as well as fancy coffeehouse-style drinks. Another popular aspect of the Ninja Coffee Bar is that the included double-walled carafes are ideal for keeping coffee at the right temperature. And the special carafe and brew selector for making iced coffee is a hit amongst users who are fans of specialty coffee drinks. Perhaps the best part of the Ninja Coffee Bar Thermal Carafe System is that you get a different coffee experience with exactly the same grounds. You can still however, play with the amount of grounds by using the double-sided Smart Scoop that comes with etched measurements. The Auto-iQ® One-Touch Intelligence Technology knows just the right amount of water it needs for the brew type and size you’ve selected. It then automatically calculates the ideal bloom time needed for your preferred cup of coffee. You can also use the Delay Brew function so that your cup of joe is ready as soon as you wake up in the morning. Just select the time that you want it to start brewing, select brew type, brew size and place the correct coffee receptacle in its place. Once it has been set correctly, the display and audible sound will let you know. If you feel that you coffee is not hot enough you can choose to use the preheat function before brewing, which takes just 3 minutes. If you don’t want to use the included permanent filter, you can instead use #4 cone paper filters. The Ninja Coffee Bar Thermal Carafe System also comes with two special double-walled carafes to keep either hot or cold coffee at its ideal temperature. And the included frother easily whips up either cold or hot milk to a creamy consistency ideal for fancy coffeehouse drinks. Coffee brewing is fast with this unit. A full carafe is ready in 6-7 minutes, while a single large cup is brewed in 1.5 minutes. For other fast coffee brewers, check out our top picks. Unlike many other comparable coffee systems, the Ninja Coffee Bar is able to froth both cold and hot milk to a perfectly creamy and velvety consistency. Anyone can enjoy fancy coffeehouse type drinks using the included frother arm. Fill a cup approximately 1/3 full with milk (hot or cold). If hot milk is preferred, microwave the cup for 45-60 seconds first. Place the cup under the special frother arm, submerging the whisk just below the surface of the milk. Press and hold the top button on the frother arm for 30-45 seconds until desired effect is achieved. In order to remove the frother whisk, simply twist it clockwise. The manufacturer recommends holding the cup underneath the whisk until you deposit it in the sink or dishwasher to minimize spills. The Thermal Carafe System is designed to brew the perfect cup of iced coffee. Instead of just brewing normal coffee and then adding ice, the Ninja Coffee Bar Thermal Carafe System comes with a special setting to ensure that the aroma and subtle flavors of coffee are perfectly balanced in your favorite cold drink. Fill the included Ninja Over Ice carafe with ice. Place the carafe under the brew basket. Adjust the selector for either a half or full-size carafe. Press the special Over Ice Brew function on the machine. The Ninja Coffee Bar Thermal Carafe System is specially designed to minimize condensation and prevent overflow while brewing the perfect cup of iced coffee. Available as an accessory to the Thermal Carafe System, the coffee caddy is the perfect accompaniment to your coffee system. An airtight lid keeps your favorite coffee fresh while separate pockets are ideal for storing coffee filters, scoops, and other essentials right where you need them. The Ninja System comes with the option of including an XL Multi-Serve tumbler ideal for use at home or to take up to 22 ounces of delicious fresh-brewed coffee wherever you go. The double wall design of the XL Multi-Serve tumble keeps coffee at its ideal temperature. Designed to hold enough delicious Ninja coffee for two people or an extra coffee to keep you going during the day, the system has a special setting to hold and pour coffee into the XL Multi-Serve tumbler. Keeping your coffee bar system looking great and producing delicious coffee is pretty simple. If the machine illuminates its special “clean” light then you know it’s time to scrub out the reservoir and make sure that no scaling has built up. The manufacturer, however, recommends cleaning the system after approximately 60 brew cycles even if the light does not come on. The stainless steel exterior is easy to clean using a damp cloth and the frother whisk is safe to put in the dishwasher. The included thermal carafe cannot be washed in a dishwasher but is easy to clean by hand. Click here to see what customers say about the Ninja Coffee Bar. No pod system allows you to choose your favorite coffee blend, even artisan ones. Much cheaper than going out for coffee. It brews fast, with a single large cup done in 1.5 minutes and a full carafe ready in 6-7 minutes. Included Ninja Over Ice carafe and special iced coffee brewing selector make fantastic iced coffee drinks. Adjustable height selector handles everything from small cups to large travel mugs with ease. Stylish, stainless steel design looks great on any kitchen counter. Frothing arm can handle either cold or hot milk. One included thermal carafe keeps hot coffee at the ideal temperature. Selector knob allows you to choose exactly the right strength and intensity of the coffee. System must be cleaned after 60 brew cycles. Cannot accept pods. If that’s what you’re after, check out our top picks for pod coffee makers and pod espresso machines. Thermal carafe cannot be cleaned in the dishwasher. You don’t have to be a coffee snob to benefit from the Ninja Coffee Bar Thermal Carafe System. Even amateur coffee lovers will quickly learn to savor each delicious cup of coffee fresh-brewed from this machine. The controls are easy and intuitive to understand, and the included recipe book has a delicious assortment of fun coffeehouse style drinks that you can easily make at home. This is a wonderful appliance for avid coffee drinkers who want to brew cafe styles at home and for a much lower price. It’s easy to see why the Ninja line of coffee appliances have become so popular. With a small footprint and an attractive, stainless steel design, the Ninja Coffee Bar Thermal Carafe System CF097 looks great on your counter and the selector buttons make brewing a cup of coffee to order simple and easy. In addition to all your favorite hot styles, it is able to froth cold milk and whip up delicious iced coffee drinks with ease, which frees coffee lovers from the limitations of pod systems without the user having to become a professional barista in order to get a perfect cup of coffee every time. Now everyone can enjoy a complete coffee bar set-up in the comfort of their own home with the Ninja Coffee Bar Thermal Carafe System. ← Which is the Quietest Blender on the Market?